Some of you might steer clear of characters such as these; characters whom Apple would have you rather not know about at all. However, if you've ever owned an iOS device, chances are you've heard the term 'jailbreak' and both the iPhone Dev Team and Chronic Dev Team have positioned themselves as the key forces behind such practices. Being responsible for the tools of the trade, these teams have proven that they know what they're doing when it comes to modifying Apple's creations beyond their original intentions. As such, when both groups announce that they have solutions for an untethered iOS 5 jailbreak and an unlock for the iPhone 4S between the two of them, it's worth paying attention. "First & foremost: during my JailbreakCon talk in September, I was excited to announce that the Chronic Dev team had already discovered 5 different exploits for use in our upcoming jailbreak. Unfortunately, that announcement was a bit premature, because in the subsequent weeks, Apple found & patched a (critical) few of those exploits, between the beta versions we used for testing and the final release of iOS5 on October 12." The issue for the Chronic Dev Team has been the overzealous crash report system in place on iPhones, which automatically sends a report to Apple when the device encounters a problem and as such allows them to quickly set about fixing said problem, in this case being some of those five aforementioned exploits. "Instead of allowing this vicious cycle to continue, we decided to write a new program to turn Apple’s own beast against its master, per se. All this program requires from you is to attach your iOS device to your computer and click a single button! At this point, the program copies all the crash reports off your device (which, under normal circumstances, would be sent right back to Apple), and instead sends this data to a secure, private server hosted by your friendly Chronic Dev Team. Next, our program needs to neuter your copy of iTunes, simply by changing your settings to prevent your computer from sending any further information from your device to Apple." The application in question, after a little interaction on your part, sends any crash reports your iPhone might encounter straight to the Chronic Dev Team's servers, rather than Apple HQ, still with us? Currently the software is only available to Mac users, but a Windows variant should be available in the next 24 hours or so, according to the team. By installing this special software, you'll be directly helping the Chronic Dev Team develop a means of creating the untethered jailbreak for iOS 5, sooner. 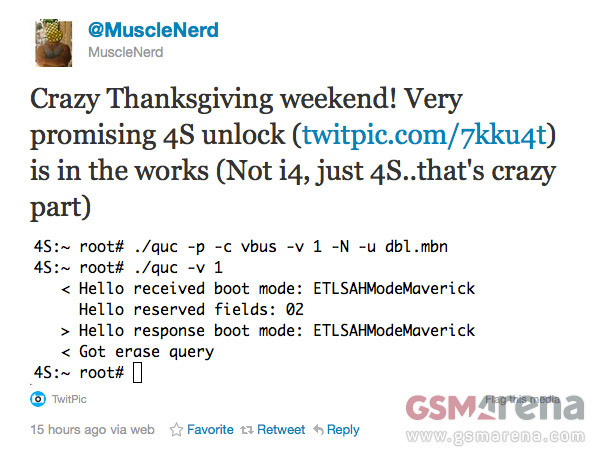 Alongside the CDT's Crash Reporter software, the iPhone Dev Team also brought a tasty morsel of hacking wizardry to the table, in the form of a potential unlock for the iPhone 4S. Mentioned solely in a lone tweet by team member @MuscleNerd. Unfortunately, there's no further detail beyond that right now, but once the unlock does become available for the 4S, users will be able to use ultrasn0w or the like, in no time at all. There is of course still a tethered means of jailbreaking your iOS 5 device (unless it's an iPad 2), but to find out how, you're going to have to head on over to the source link and beyond. The Chronic Dev Team's blog can be found here (along with Joshua's Twitter feed here) and the iPhone Dev Team blog is here (with @MuscleNerd's Twitter here). We should add that those of you tempted to mod or jailbreak your iOS device, do so at your own risk and if something were to go wrong, you can't say we haven't warned you. Also if you still haven't read them, why not check out our thoughts of iOS 5 here and the iPhone 4S here.